Lines from Linderhof: Happy Thanksgiving! Alas, there will be no aroma of roasted turkey wafting upstairs this Thanksgiving morning as we're spending Thanksgiving with Daughter Sarah's Andy's parents. Soon, however, after breakfast, the aroma of freshly baked pumpkin pie and freshly baked cranberry crumb tart will fill the air -- my contribution to Thanksgiving Dinner! I love Thanksgiving for it's all about family as we gather at the table and give Thanks. 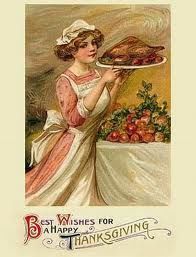 Have a blessed Thanksgiving, dear! When I count my blessings... your name will be added to my list!Thank you for your sweet friendship this past year! I hope you had a grand dinner, Martha! I loved your previous post about the platter - what a find!